I can see the Mediterranean through the kitchen window. Just outside the door, a tree of candy-bright mandarin oranges means I’ll have freshly-squeezed juice with my breakfast on the long veranda that fronts this traditional Greek house. The nearby lemon tree is heavy with enormous, fragrant fruit, perfect for my afternoon lemonade. Further out on the property are almond, pomegranate, olive, apricot, even peppercorn trees—it’s like having an outdoor market in your very own yard. And this house also just happens to come with cows and chickens. I didn’t buy this house, and I don’t pay rent or bills for it, either—but it’s mine to enjoy for the next six months while my boyfriend and I house-sit here, amid the magnificent landscape of the Karpaz Peninsula in Northern Cyprus. 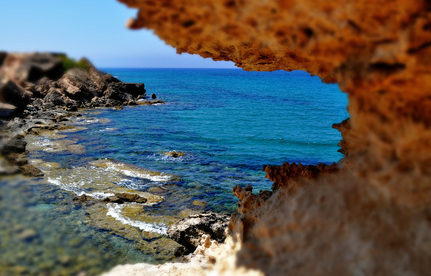 Before coming here, I had read some strange and fascinating things about the Karpaz Peninsula, as if it were a magical place. Much of it is true. There’s an energy on this isolated and largely undeveloped stretch of land. Wild donkeys roam at night through flower-filled meadows and olive groves, or trot over the wild asparagus that sprouts through the sand on the vast beaches. For now, it’s my home, and I’ve got a daily routine—the animals require it. So each morning we wake up around 8 a.m. and, while one of us prepares breakfast, the other feeds the cats and dogs. Breakfast—even in the wintry months of December and January—means sitting out on the veranda, strong sun on our faces to wake us up. The scrambled eggs are courtesy of our very own free-range chickens, and the bread we pick up fresh from the village bakery. Once we’ve warmed ourselves in the morning sun, trying to remember how cold winter is supposed to be, we slip into our galoshes and head off toward the chicken coop and the cows. We get the animals fed and watered, let them out to wander, and tidy up their areas within 30 minutes or so. By then it may not even be 10 a.m. yet, and the wide-open peace of a North Cyprus day awaits. This peaceful region has become my very own writer’s retreat, and on most days I write at home until lunch, which we also eat outside on the veranda. After lunch, I make a satisfying pitcher of lemonade from our beautiful lemon tree, and then it’s back to writing or maybe a wander around the property or the village. At mid-afternoon we usually take the dogs out for a long walk: through green fields, flowery meadows, olive groves, and old, abandoned houses and churches now used by shepherds for shade in summer. But even from our own backyard, we have an enviable view of the sun slipping slowly beneath the sea. By the time we’ve cared for the animals, the daylight is fading. I gather up firewood from our stack outside and take it in. The old palm branches make great kindling, and we’ve also collected wood from our local walks and trips to the beach. As we start to make dinner, we’ll light the stove in the living room that keeps us warm through the rest of the evening. Before bed, I step out onto the veranda, look up into a night sky full of stars, and thank them all. Editor’s note: Learn more about Cyprus and other countries in IL’s daily postcard e-letter. Sign up here for these free daily postcards and we’ll send you a FREE report on The World’s Best Climates.